Gemstone jewellery should be cleaned with a soft, damp cloth. For color or clarity enhanced gemstones, ask a The Hunt House Fine and Custom Jewellery professional about cleaning and repair for your gemstone jewelry. 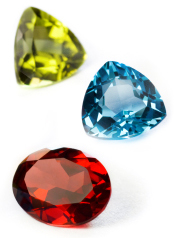 For more information about each particular gemstone, read our gemstone guide.